The Mr. Green Jeans team believes there is more to insulating a home than just installing a product which is why we take such interest and pride in our installation techniques. 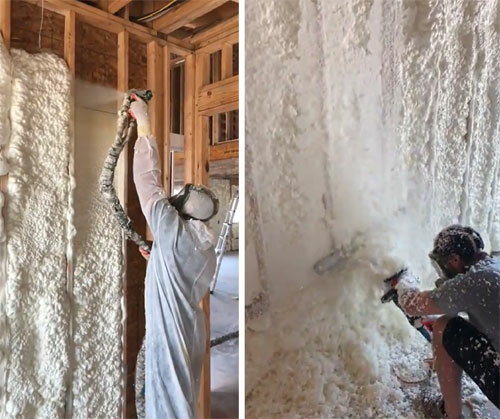 We recently discovered a new and improved way of installing insulation that will have your home’s A/C system working at maximum efficiency and we want to sing it from the rooftops, FULL CAVITY FILL! The late Maya Angelou said, “Do what you know until you know better then, do better.” And we couldn’t agree more. It’s the full cavity fill technique or bust for all new builds and existing cavities from now on! So, what’s the 411 on this technique and more importantly how does it help you save money? The depth between the studs in your attic is about 3.5-4.5 inches deep. The best standard practice for injected insulation USED TO BE to fill 3-4 inches of this space with spray foam so as not to create an overflow affect once the foam had expanded. This is called a partial fill and it’s still used in certain scenarios. The partial fill technique was the standard way of doing things and it was the most effective technique available, but it isn’t perfect. A small percentage of heat is still able to sneak in (or escape depending on the season). Enter – the Full Cavity Fill – Injected technique! There are two different methods of the full cavity fill technique that are equally valuable depending on the type of build or home you’re in. Built In: Consists of installing high performance wall insulation boards with interlocking gas tight edges and a moisture redirection plane. It’s best used on existing traditional builds featuring tighter cavity spaces. This is a more practical and affordable solution for those who want to avoid investing more money into the widening of their traditional sized cavities but still want the full coverage that full cavity fills provide. Injected: Consists of blowing in insulation to fill the cavity PAST the studs then, after the foam has reached maximum expansion, shaving the excess off with a specialized tool called a CI Cutter. The CI cutter is designed to remove excess insulation efficiently promising zero damage to studs and little to no damage to outlets, wiring and plumbing. This method ensures that the cavity is filled to capacity and the airtight seal insures maximum efficiency. Don’t get us wrong, there is a time and place for the use of the partial fill technique and it’s not wrong to use this technique. It uses the same quality materials as the Built-In method and it’s a more affordable option. However, it delivers an admittedly reduced thermal performance. If your home or business has already invested in insulation but you aren’t seeing the savings you think you should on your utility bill, it may be due to an outdated technique or a partial fill. Whatever the case may be, the best way to find out is to pursue an energy audit. Mr. Green Jeans energy audits are used to assess the possible air leaks, current insulation, and heating/cooling equipment in your home or business. This will help us both understand which method is best for you! What works best for your wallet. So, don’t be afraid to reach out! Let’s chat about your space, your budget, how to get your home’s insulation in peak performance, and how we can get the ball rolling with a free estimate! Call us today for more information at (225) 644-0548 in metro Baton Rouge or (504) 754-0075 in metro New Orleans.